Bad Breath, also called as Halitosis, can occur due to many reasons. It may not be limited to Dental, but there are general health conditions too which can alter the odor of the mouth and can provide breath that is unpleasant to the ones around you. To treat the bad breath, one should have a proper knowledge of what could be the main reasons for the bad breath to occur. Depending on the cause, the bad breath can be either short-term or a long lasting one but the treatment would depend on the cause, and just using the mouth fresheners and washes won’t do the job of keeping the bad breath away. One of the major reasons for the foul odor is the breakdown of food particles in and around the teeth, where the bacterial colonies start forming and act on the food particles to form acids and foul smell producing compounds. Certain foods like Onions, Garlic and a few other vegetables and spices produce bad breath, as after these food items are digested, they enter the bloodstream and then are carried to the lungs, which eventually would affect the breath. 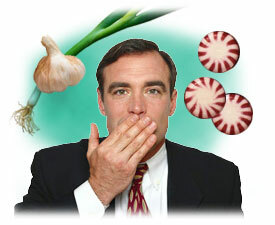 Check out the various foods responsible for bad breath. Proper brushing and flossing are necessary regularly, and if you don’t maintain that, the food particles remain in your mouth and cause bad breath. In a few hours after you have your meal, there is a thin sticky film that forms on the tooth surface, called as Dental Plaque which if not brushed away, may irritate the gums and with time, would become harder and form layers called calculus which all are the reasons for bad breath. The surface of the tongue is uneven, and can be a house for the bacteria which may produce bad odor. If the person has a Denture placed in the mouth, either a complete one or partial denture for few teeth replaced, it has to be maintained and kept clean. Even if the denture doesn’t fit properly in the mouth, it has to be shown to the dentist for the correction, or else there would be a collection of food and bacterial colony formation, which would act on it and cause bad breath. Gum diseases with the pus discharge would produce a very foul metallic odor, and apart from the infections, it is the surgical wounds after the oral surgery which could lead to bad breath. Tobacco and its products in any way are a definite reason for very unpleasant mouth odor. Smoking, oral chewing of tobacco and snuffing are all different ways of taking tobacco into the body. It is not just the oral cavity that is affected, but even the lungs from where the foul smell comes out. Alcohol too is a reason for developing bad odor, and although many would consume it at night, even after brushing and rinsing the mouth, the odor doesn’t go away. Small stones are formed on the tonsils occasionally, and these are usually covered by bacteria which produce odorous chemicals. Apart from the tonsils, it is the inflammation in the nose, sinus or the throat which can lead to a postnasal drip and bad breath. It is the wet mouth due to Saliva which keep the mouth fresh and clean from any food particles, and thus no bad odor. But, if the person is suffering from the condition called Xerostomia or Dry Mouth, there us a bad smell as the production of saliva is less. Patients who have got radiotherapy done to treat cancers, or taking a few medications that release chemicals can also produce bad breath. Radiotherapy leads to dry mouth, eventually leading to Halitosis. Additionally you may check the fluids which lead to bad breath. There are a lot of things that can cause bad breath but just as many things can fix it! Brushing your teeth gets rid of odor causing bacteria and flossing can get rid of any little food particles that are lurking around. You can invest in mouth wash, a new toothpaste, or even just chewing gum.